The Philippines northern paradise, Batanes, is a place that I proudly call as ‘home’. Ask any tourist who has been to our group of islands and they will surely speak volumes of its utter beauty and serenity — however, that doesn’t stop there because Batanes food or Ivatan cuisine is something to rave about too! We are surrounded by clear seas and lush greenery after all, so you will definitely find a varied selection of seafood and vegetable dishes. They may all be cooked in a way that is simple, but I guarantee you, they are all flavorsome. The best part of it all…? You’ll be assured that every plate will be fresh and organic! 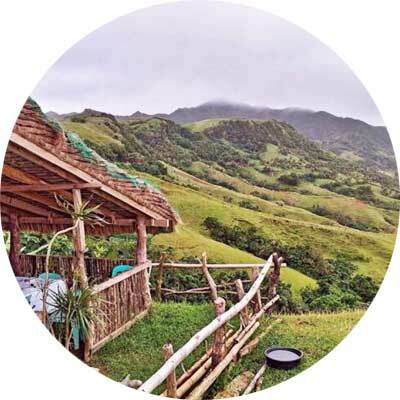 So in order to make the most of your Batanes itinerary, let me give you an idea of the top Ivatan food or dishes to try, as well as where to best try them. Called as ‘tabtab‘ in Sabtang (one of the 3 inhabited islands in Batanes), uved or uvud is one of those Ivatan comfort food that I always miss! 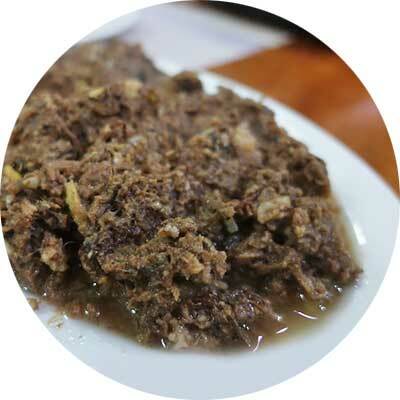 It’s basically made of finely-grated corm (which is found at the base of a trunk of a banana plant) that’s mixed with ground meat (beef or pork), and minced fish. Afterwards, it is seasoned with onion, garlic, salt and pepper. This will be rolled into balls or served as is and can either be with or without its broth. 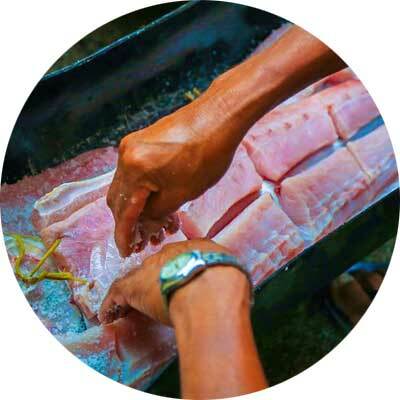 Lataven – are you familiar with kinilaw-style of preparing fish meat in the Philippines or simply, ‘ceviche’? If yes, then lataven is very similar to this. Dibang (or any kind of fish) is drenched in vinegar and calamansi juice, as well as mixed with minced ginger, onions, and salt. Maytahes (one-day-old) – after the fish is cleaned and opened up, it will be marinated in salt, vinegar, and garlic and then laid out under the sun for a day to dry. This is a dish that my father used to prepare a lot for our family (he cooks it real good!). This is made of preserved gabi (taro) stalks which could technically last for years. As a typical Batanes food, the gabi stalks are first soaked in water. Afterwards, it will be cut and minced and then cooked together with pork and patola (or sponge gourd). You could surely think of it as another version of laing, a Bicol specialty in the Philippines. Payi or lobsters are abundant in Batanes, so a humongous one can be easily bought for as cheap as Php 150 (or $3)! Indeed you could imagine my surprise when my family and I moved out of Batanes and I found out that my favorite payi is ridiculously expensive in the city. As for another crustacean that you’ve probably heard about would be tatus or coconut crabs which are well known for its sweet meat and creamy aligue (or crab fat) — after all, they feed on fleshy fruits, nuts, seeds, and coconuts (which is not a big part of their diet, contrary to popular belief). Anyhow, these coconut crabs are impressive because they can climb a coconut tree, take one, and cut its husk with just their claws; although… it can actually take several days for the coconut to be opened. Now here’s the thing: tatus is declared as an endangered species. If you search Google, there’s actually no official statement that they are endangered; but in Batanes, it has been declared as so because it’s noticeable how it has become considerably difficult to find or hunt for them. I do remember that when I was small, my father can catch coconut crabs easily if he just goes to the forest and fields, but it seems that nowadays, such is not the case anymore. Starting this year, consuming them is NO longer allowed. And in the rare case that you happen to stumble into a restaurant that offers you one, please refrain from eating it to help alleviate this problem. 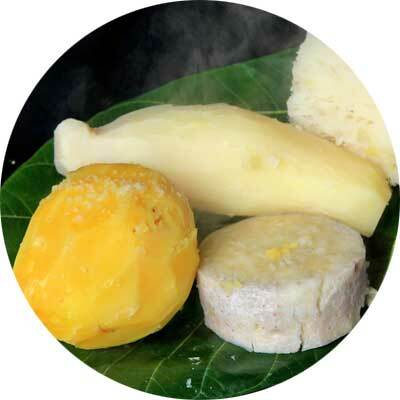 I mean I know that I’m kind of a tease for even discussing tatus when it’s actually a banned dish, but I feel the need to mention this so as to help educate you guys about the situation revolving this ‘endangered’ species in Batanes. Thanks for cooperating with us Ivatans! They’re steamed, fried, or smoked; but recently, we have started to make different ways of cooking it (I’ve heard that there’s even a wakay donut now). Personally, I love to eat them fried and then dipped in condensed milk or coconut cream! This is a different version of the popular Filipino dish, adobo, because luñis is rather served dry. 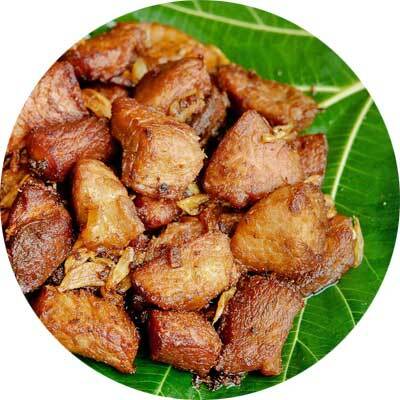 Lasting for quite a while, this traditional dish is made of pork cooked with rock salt until its fat is rendered and it turns golden brown. Back in the old days, it is stored in its own lard in jars for months to ensure continuous supply. To best eat luñis, I love to pair it with supas whilst dipping it in vinegar and garlic! 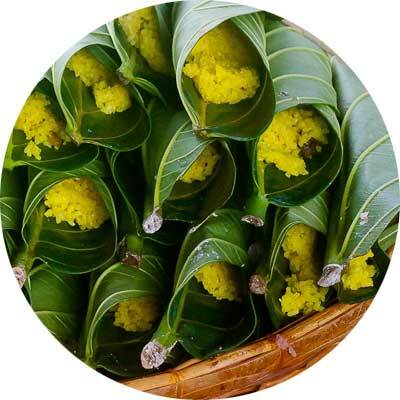 Always a staple during fiestas or festivals, supas or balencyana (as called in Itbayat Island) is rice cooked in turmeric pulp (yellow ginger) that’s often mixed with garlic and pork. It’s aptly called as yellow rice because, well… it is yellow from the turmeric. Some people would often say that the taste is close to ‘java rice‘, and that’s right! Though, I have to say that I like our supas more when it comes to flavor. 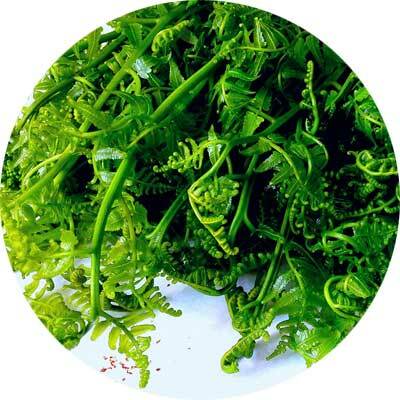 Tamiduk – also called as pako or Fiddlehead fern, this is arguably the most popular vegetable in Batanes and one of my favorites too! 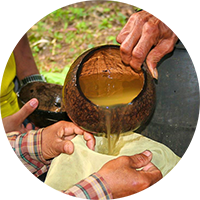 When I was still living in the island, I often helped prepare it for our meals as it was easy to make: simply sauté and season with salt, garlic and onions. If you go to restaurants, they serve it as a salad with dressing (such as calamansi vinaigrette). Utut nu Bulyas – my favorite morning fix, these are scallions or green onions that are sautéed together with scrambled egg and spices. Chinavules – these are steamed taro leaves that are mixed with garlic, ginger, and onions. Arayu – also called as mahi-mahi or golden dorado, this fish is indeed of golden color and slightly mixed with hues of blue and green. 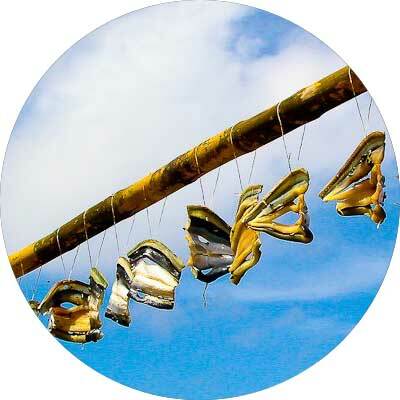 In Batanes, harvesting this fish is a part of a sacred tradition (kapayvanuvanua) in the small fishing village of Diura. Up to this day, the Ivatans there still practice it as they believe that it will protect them from the sea as well as give them a bountiful catch. Kanañis – octopus that is commonly fried, this is often a favorite when it comes to beer drinking sessions! Uni – these are sea urchins and they can be eaten raw or cooked. Dumay – also called as a ‘common periwinkle’, dumay is a species of small edible sea snail; however, as much as I love them, it’s a bit of a pain to eat (you have to use a pin to scoop it out, but I bet restaurants can serve this to you without its shell). When I was still living in Batanes, I don’t think we ever had restaurants — except for SDC which was more of a canteen than a restaurant if you ask me. 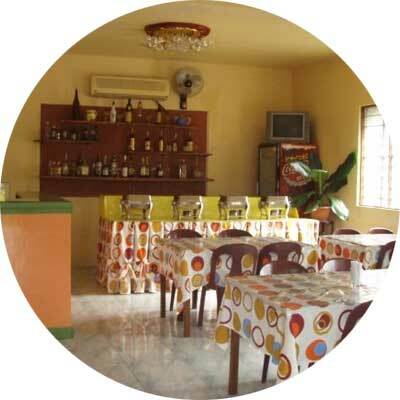 An octagon-shaped restaurant, this has an excellent outdoor deck area with awesome views over the West Philippine sea, Naidi Hills, and Basco port that’s located on the National Road near the Basco welcome sign. 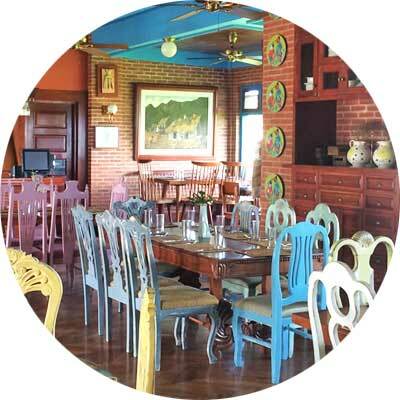 In here you can find both local Batanes food and Filipino food. The sole restaurant of the luxury hotel Fundacion Pacita, this place does not only have a picturesque view over the sea, the hills, and Mt. Iraya but it also offers delicious Ivatan and western dishes for your fancy. When you’re out to check Rakuh a Payaman (Marlboro Country) or Vayang Rolling Hills in Batan, you will find the humble canteen of Marconine’s. However, don’t let its size fool you because it offers you grand views and sumptuous meals at a very affordable price! No contact number or email available, but it’s the only restaurant you’ll find at the spot. 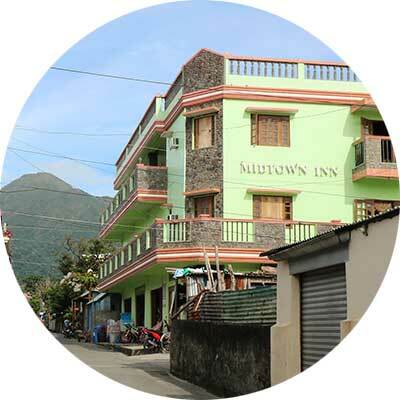 I know the owners of this hotel and I have ate at their restaurant for most of the time while I was visiting Batanes — and boy, they prepared all of my favorite Batanes food perfectly! Abad St, Cor. Lizardo St.
Next NIIGATA PREFECTURE: A NEW JAPAN FOODIE DESTINATION!